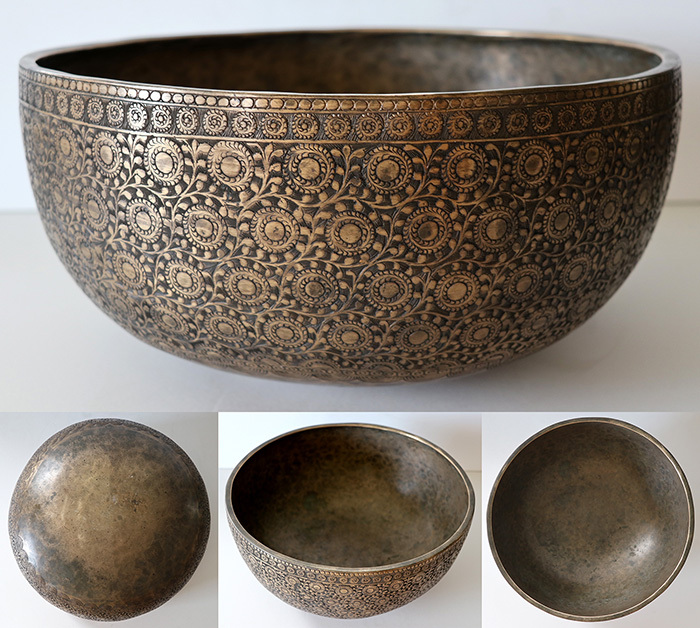 This large 12 inch Ceremonial Jambati singing bowl was recently sourced in Bangladesh. It has a glorious voice and is one of the finest hand-beaten and engraved bowls that I have encountered in over 30 years of collecting. Almost the entire outer surface has been incredibly engraved with a repeating floral pattern surrounding what appears to be a sun motif, and would have taken weeks if not months to complete. This is an old bowl with signs of long usage, but it has been superbly forged and is structurally sound and in superb clean condition. It is difficult to date this lovely bowl, as it is one-of-a-kind. The incredible decoration is quite unique and unlike any of the modern engraved or etched bowls found in Nepal today. It is an example of the finest craftsmanship to be found anywhere in the singing bowl world. The fundamental note is a low second octave G# (102-103Hz) that is close to perfect pitch when struck with a padded mallet or played around the rim with a suede ringer. This bowl is also capable of producing fountains if played with a little water inside, and the vibrant OM sound if played around the rim with a heavy suede ringer. A Tibetan silk brocade bowl cushion, a padded striker, and 2 ringers are included in the price.